Starting a new school is always scary. But try being Cece, a first grader going to a school for ‘normal’ kids after spending kindergarden with those just like her. You see Cece is deaf. She needs hearing aids just to be able to hear a person and even then she cant understand them a lot of the time. Now she has the Phonic Ear, which is massive and will make the other kids stare. Whats worse is that the teacher has to wear a microphone and Cece has to explain why in front of everyone. Cece struggles to make friends who see her for her and not for her differences but when Cece notices she can hear the teacher across the entire school it sets off some fun that she didn’t think would be possible. 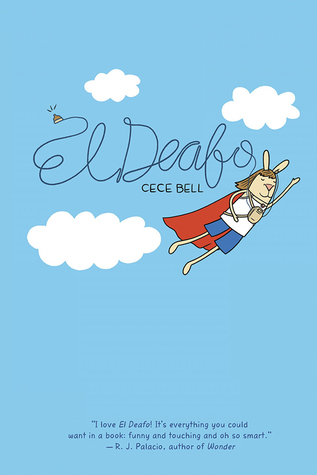 Cece is on the way to becoming El Deafo, the superhero of hearing, and the only thing that would make that better is if she could friend a True Friend to be her trusted sidekick. What an absolutely amazing, adorable graphic novel! I knew I’d love it but now I’ve read it I want to drop a copy off at every primary school in my local area and shout about it from the rooftops. El Deafo is based on the authors true accounts of being a child. Cece Bell was four years old when she suffered an illness which resulted in her becoming deaf. During the 70’s technology wasn’t what it was now and the ply option for her to hear at school was the Phonic Ear, a huge hearing aid that had to be strapped to her body with cords running up to hear ears. El Deafo covers some of the things that she can remember happening to her and shows some of the feelings she had when she was a little girl – including loneliness due to being the only deaf kid in the school, frustration at the way some people spoke to her and anger at those who were meant to be her friends yet couldn’t deal with the differences between her and them. I loved every minute of the graphic novel but it clearly shows how difficult living with deafness is and how awful it must have been for Cece at that age to come to terms with. The graphic novel format was used brilliantly well in this story because it allowed for Cece to be anything. The character Cece was more humanoid animal than human, and the pictures reminded me of kids TV show Arthur a little bit, but thats not a bad thing at all! I loved the story and its impact on me but I think it was helped by the pictures and I think they will help younger readers think about the situation because Cece could be them, but at the same time she’s not anyone. The proof copy I had was in black and white and I understand that the finished version will be in colour and I can imagine it will look great because I loved the illustration in this one, so colour will only add to its brilliance! I can’t rave about this book enough. I really want more diverse characters to read about and this is one book that handles differences perfectly. It shows how differences can make a person feel and how to handle them the best way too. I think a lot of kids will love this story for both its realistic portrayal of characters and because of how fun it is to read, with Cece dreaming about her superhero powers every few pages!